Are You Ready … for some delicious, nutritious food suggestion? Tonight we had fish tacos, something very Tex-Mex and yummy, but since I don’t actually know, how to prepare fish tacos, I had to invent the recipe. We had been to Whole Foods in San Antonio yesterday and brought back a gorgeous piece of never frozen, wild amberjack fish filet. If you’re ever in doubt, which fish to buy, the Monterey Bay Aquarium Seafood Watch is a great and useful resource to promote not only the consumption of healthy fish but also sustainable resourcing. A worthwhile bookmark!! Here’s a list of ingredients & preparations for my ‘El Rancho Leon Fish Tacos’. 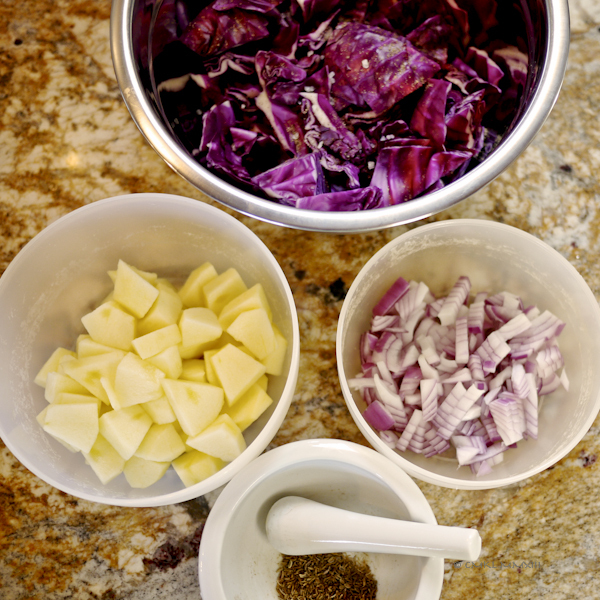 The first item is a red cabbage preparation that yields sweet and crunchy cabbage … no, no, no … cabbage candy, thanks to the balsamico, in which it is braised. turn down heat to low, add some lemon juice, shake & cover pan and cook for another 5 minutes. 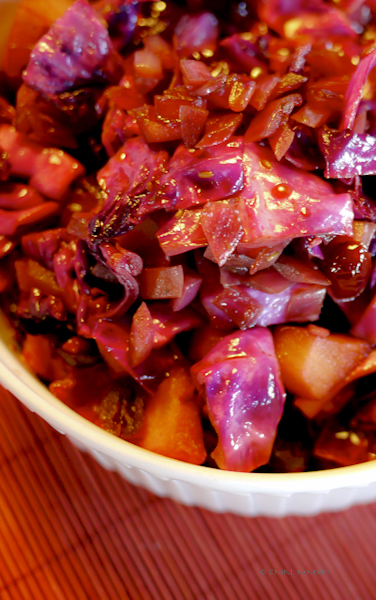 Cabbage Candy is ready to eat warm, or cold. I’m cooking on an induction cooktop. For gas, adjust settings to your customary use, for electric cooktops – you’re on your own! Marinate a piece of firm white fish – I used the really thick amberjack filet (Seriola dumerili, Carangidae) in a mix of mango nectar/lemon juice/crushed pineapple and freshly ground black pepper, covered at room temperature, for about one hour. Dry fish with paper towel and apply olive oil. Arrange your hunk of fish on a bed of finely shredded white cabbage, mixed with the fruity marinade, in a corning ware dish of appropriate size. Shove in the oven and bake for 20 to 30 minutes, depending on size. I used a temperature gauge, where you insert a thermometer into the fattest part of the fish. Once it reads 120ºF, I turned the oven off and let it finish at an internal temperature of 140ºF. Now we’ve come to the taco dilemma. Being calorie conscious these days, I don’t really eat any tortillas (roughly 190 calories a pop), which makes the preparation of fish tacos somewhat difficult, as tortillas happen to be the taco part of fish tacos. Fortunately, I have a husband, who doesn’t have to be quite as concerned with caloric input, as I currently am. For him, I can prepare actual tacos, while it’s more of a ‘Fish on a Bed of Lettuce’ for me. If you happen to have large lettuce leaves, you could go the Vietnamese or Korean route and wrap the fish and cabbage in lettuce leaves, creating a wrap, rather than a taco. If you’re going for the taco version, nuke a tortilla for 30sec/100% to puff it a little, spread ‘Gourmet Garden’ cilantro paste and sprinkle shredded jack cheese over the whole tortilla. Then layer a few slices of queso blanco (fresh, mild cheese made from cow’s milk, similar to farmer’s cheese) over half the tortilla and nuke again for 20 sec/100%. Immediately place chunks of flaked fish over the queso, drizzle with lemon juice and grind some pepper over it. Finally, spoon juicy cabbage candy over the fish and flip the empty tortilla half over the whole shebang. Voilà, your El Rancho Leon Fish Taco is ready to enjoy! The addition of fresh cilantro, garlic, and lime juice would certainly have been a good way to spice up the tacos even further – we’re just so far from shopping opportunities that we don’t always have a full range of fresh options in our pantry. Prepared as described, 200g/7oz of Cabbage Candy has 160 calories and 113g/4oz of amberjack has less than 140 calories. Hört sich sehr lecker an! Habe ähnliches bisher nur mit Weisskohl gemacht, mexican way. Aber Rotkohl ist ja bestimmt noch gesünder. Leider kann ich natürlich hier nicht so tollen Fisch bekommen! like dieting. I haven't really eaten much bread or similar carbs in a while by deciding that I don't really need it. Most of it is not good anyway, now a $5 loaf from an artisinal bakery that is a different story. I don't consider that bad. But just have one slice. I am waiting on some lemon sorbet to congeal as I write this to fill it back into the lemon shells. Remember those?